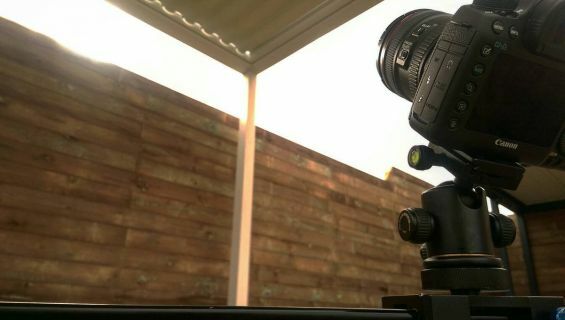 Earlier this autumn we caught the last of the sunshine and organised another Classic Outdoor Living Pod™ photoshoot and this one was certainly one that we were not going to miss. 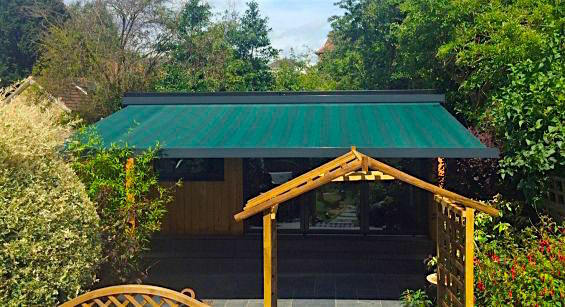 The clients had taken a lot of time and effort to completely transform their garden landscape and we were ecstatic to find out that our louvered pergola was going to become the centre piece to harmonising their newly developed dedicated outdoor living space. We have been looking forward to showing you these new images from our summer photoshoot from a little coast town in West Sussex. What was once a basic garden landscape has now transformed into a Mediterranean retreat and we are so proud to have been involved in the process of this major renovation. Extend your outdoor living lifestyle. Are you finding yourself cutting your outdoor living lifestyle short because of the chilly evenings we are now experiencing? Well it’s time to put a stop to that so you can extend your evenings and make the most of your garden space all year round. 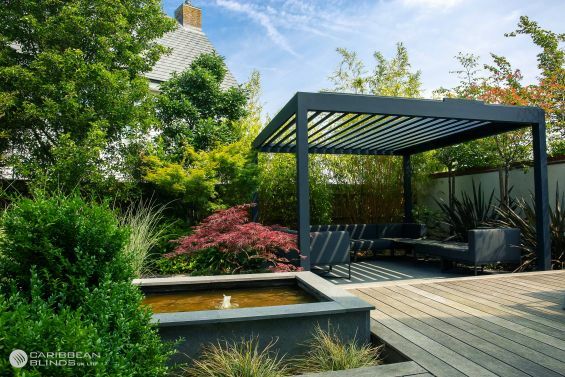 Brits all over the country are now enhancing their spaces and designing a garden with a dedicated outdoor living area that they can use during colder seasons. 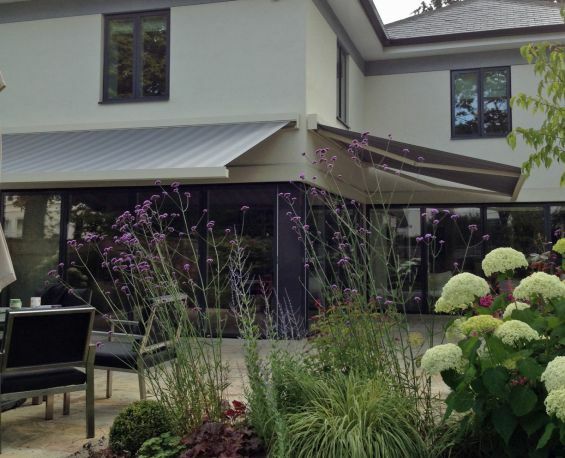 The weather has been in the digital team’s favour this summer as they continue to venture out to clients to capture their exquisite External Shading and Outdoor Living Installations in situ. 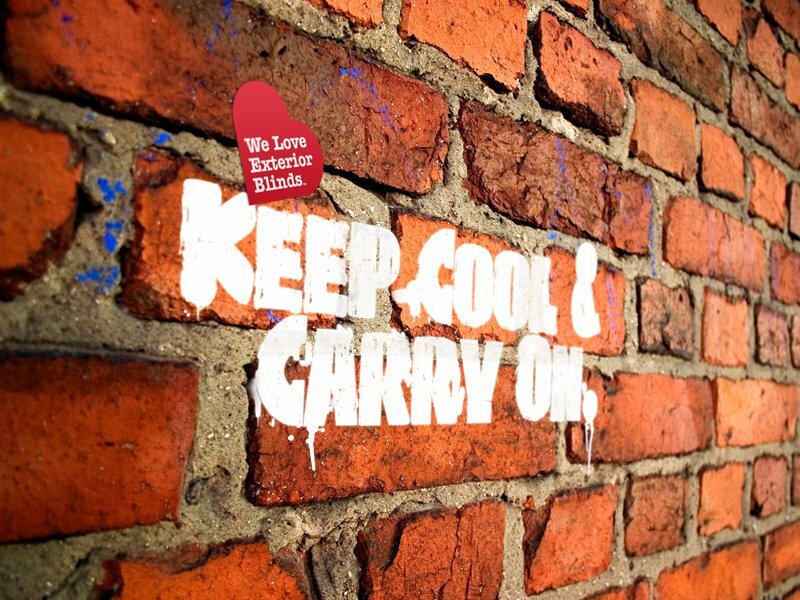 We have been even busier due to the consistent hot weather which meant there were a lot of installations for the team to choose from, it was a difficult task for them but we believe they have selected the perfect examples to highlight the great benefits of our systems and to inspire you to improve and transform your own space. 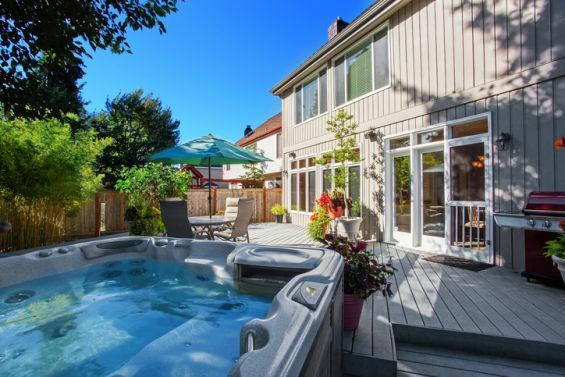 We are currently experiencing a heat wave this week and I am sure many of you have been wishing that you had a dedicated outdoor living space to come back to after a hard day at work. 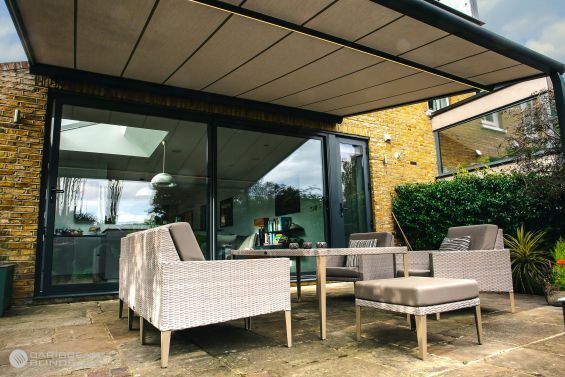 Nobody wants to be stuck in a stuffy home when you can be outside enjoying the sunshine in a perfectly harmonised space with a comfy outdoor furniture set and the adequate amount of shading to create the perfect balance. 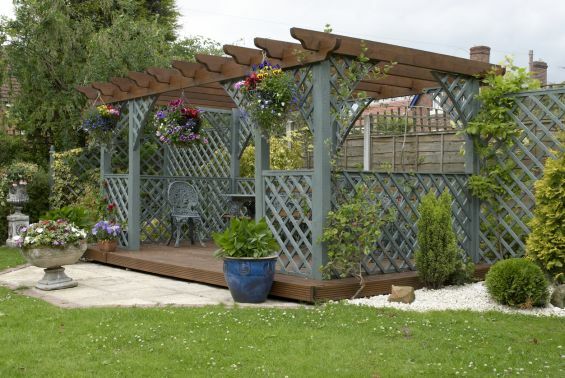 We have three options that we would like to share with that will help to transform your garden area. Only 14 days to go until summer is officially here, have you got your garden ready for the season ahead? 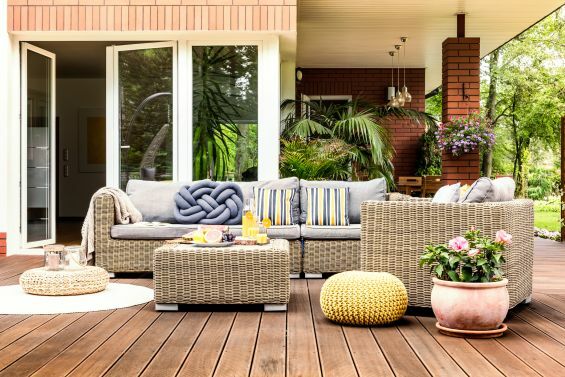 It’s time to make the most of your outdoor living space this year so we have come up with 6 top tips to help you do just that. 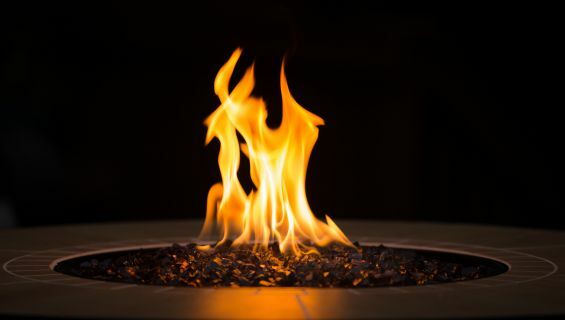 Outdoor Living continues to trend as people all over the UK are transforming their external areas with stylish furniture and dining sets, outdoor pizza ovens and fire pits. The sun is on our side this year so it’s time to embrace the Mediterranean lifestyle and maximise on the garden space. So let’s take the party outside and create the ultimate patio feature. Adding an Outdoor Living Pod™ will change the way you use your space. Spring is only six weeks away so now is the ideal time to prepare your garden space for the warmer weather ahead. Gardens are often overlooked when we come to decorating and furnishing, the last ‘room’ in the house to get attention, often consisting of little more than a patio, BBQ, shed and maybe some chairs and a table. Enjoy the growing trend for Outdoor Living and embrace the Mediterranean lifestyle, as we’re set to bask in glorious sunshine this Spring/Summer. There is a buzz in the air as Christmas draws closer, with precisely 18 days to go we cannot wait. It’s an opportunity to reconnect with family and friends and appreciate what we have by celebrating with food, drink, games and entertainment. Every family has their own set traditions but we want to show you something that could really change the game for Christmas, something unique and special that will have your family and friends talking. 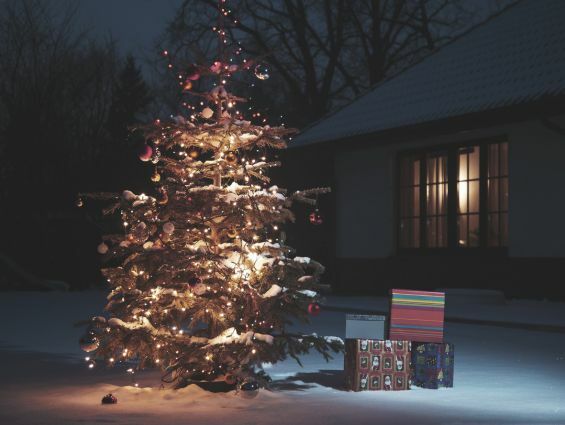 Put some sparkle into your outdoor space with our top 5 outdoor Christmas ideas. Some of you may have already been to your first Christmas fayre over the weekend and I am sure a lot of you have already noticed how busy everything is with everyone in a rush to get some great deals early on. We are coming ever so close to December and now that the nights have drawn in early it’s time to add some magic to your home with some festive decorations. We have put together a short list of our favourite outdoor decoration ideas that will make your home come to life and stand out. 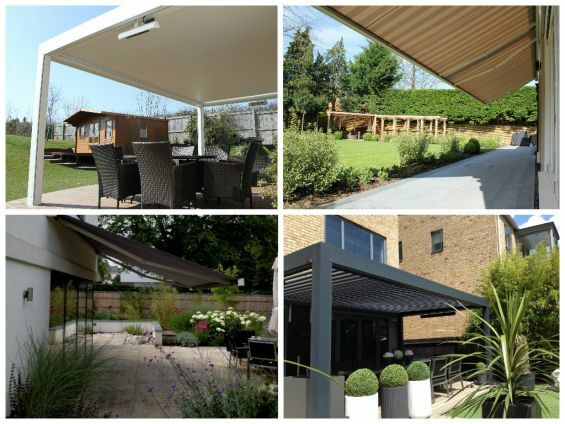 The different ways our clients use our Award Winning Louvered Roof. 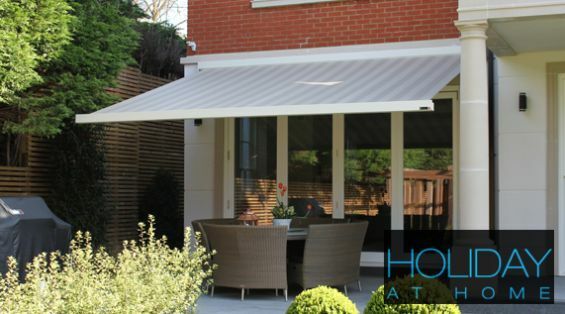 The popularity of outdoor living in the UK continues to grow and therefore sales of outdoor living products are no surprise on the up. People are looking to reconnect with the outdoors and in order to do so they need to create a living space that will provide a relaxing environment including shelter, warmth, lighting and comfort. 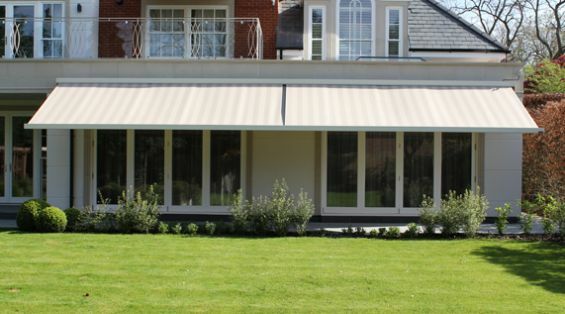 At Caribbean Blinds we provide the perfect shelter solution in the guise of our award winning Outdoor Living Pod that enables you to take full control of the elements. 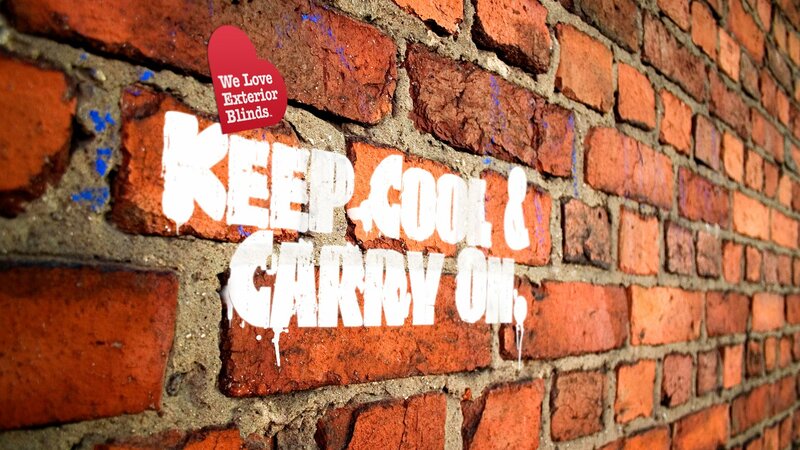 We want to give you an inspirational treat to get your home ready in that last minute effort. 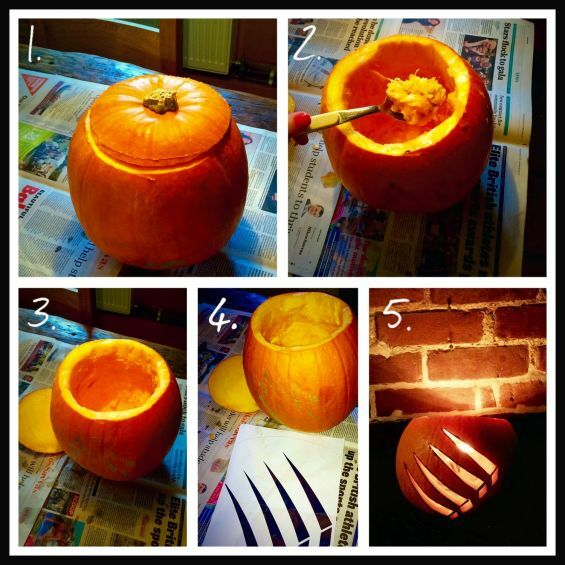 It’s Halloween and it’s time to get the decorations out and the pumpkins carved because there will soon be a flooding of miniature goblins and zombies roaming the streets and knocking on doors for treats. It’s a fun festivity that doesn’t just have to be for the kids, here are 4 inspirational quick ideas that you can get done before the kids get home from school. 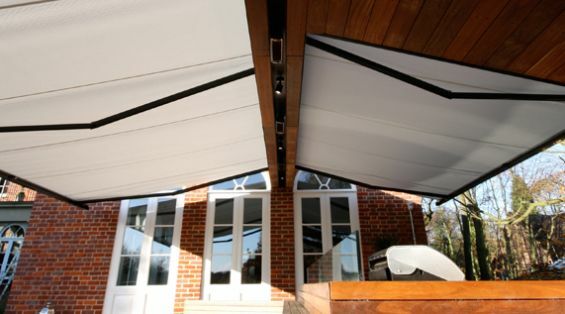 When we think about outdoor living we mainly associate it with Summer but outdoor living is so much more than that. It’s about enjoying the fresh outdoor space all year round from summer to winter and using your living space to its full potential on all occasions. 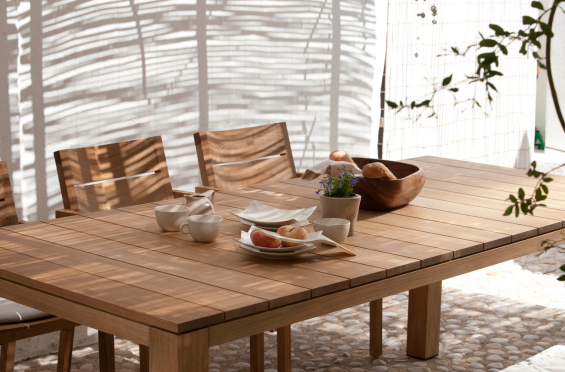 Tables to suit every outdoor living space. Outdoor design ideas to make your garden an extension of your home. 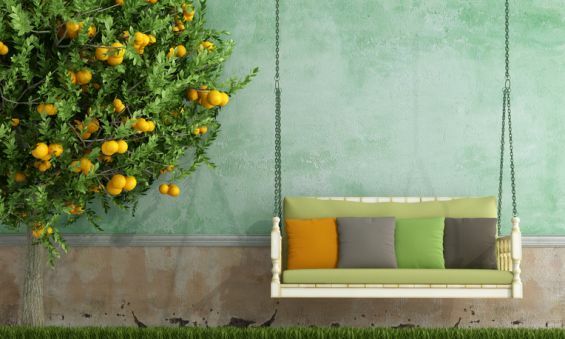 Outdoor Furniture Ideas to Transform your Garden Space. During the summer most people will be relaxing and making full use of their outdoor living space, but for some this is a time for transforming, updating and upgrading the garden retreat. 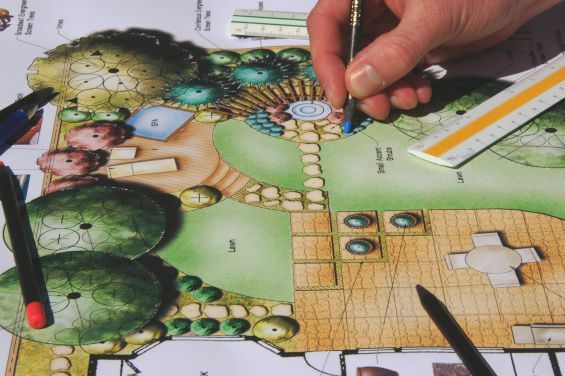 The garden is a private outdoor bubble that is the focal point during the hotter months which is why many will be working hard designing and digging deep to landscape their ideal haven. 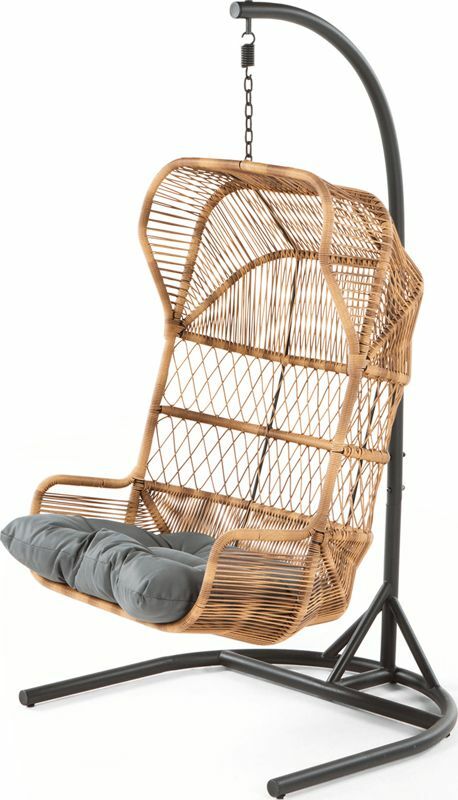 We have put together an inspirational collection of Outdoor Garden Furniture Ideas that will add a great touch to your garden design. Which way will you go this summer? One of the best things that we love about summer is the BBQ smells that linger on every street corner, nothing beats that distinctive smell of meat being grilled over a hot fire. As the summer gets into full swing so do the social gatherings and there is no other way to host a party then to invite your loved ones over to gather in your outdoor space to drink, eat and laugh. Most will agree that hosting a BBQ party is the perfect way of getting people together. 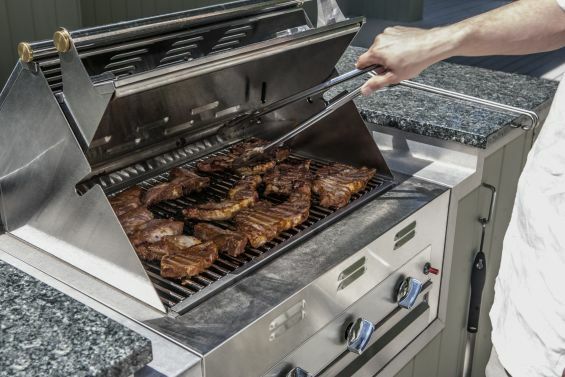 If you are yet to initiate your summer with grill fest and have not yet purchased a grill or looking to upgrade then let’s take a look at the two main types on offer. Is your garden looking a bit gloomy? 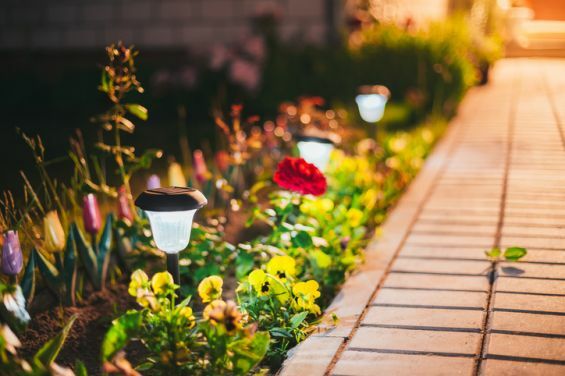 Garden lighting can sometimes be overlooked by many of us but adding this element to your exterior space will give you a magical atmosphere to relax in when the sun departs. By transforming your garden to a glowing retreat you can adopt the alfresco lifestyle and extend your outdoor leisure time. The long Easter weekend has given us a little taste of the summer; the weather is warmer and we are starting to spend more time in the garden relaxing or entertaining. 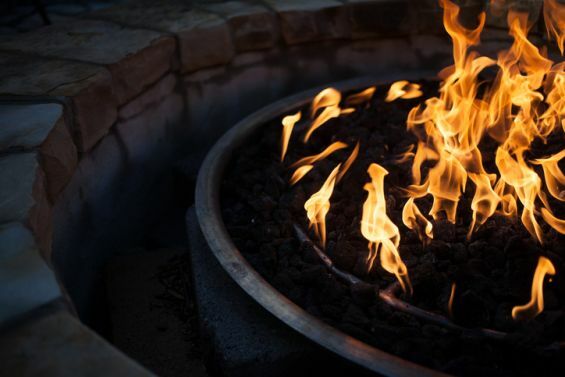 Many of you may have already initiated the outdoor living lifestyle with a BBQ and I am sure these will be a regular occurrence as we get deeper into Spring. These simple touches will go a long way. As we start the transition into a colourful season with blooming plants and blue skies, there is a sudden sparkle in the atmosphere lifting our spirits. Easter for many is a time to appreciate what we have and to cherish life for its gifts it presents us. 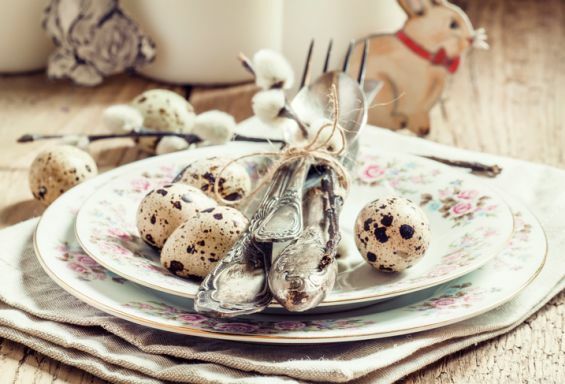 This weekend people all over the country will be celebrating with family gatherings, Easter egg hunts and long walks in the countryside. It is an exciting and pleasant time and I am sure that all the preparations are in order. For those that are a little on the drag or looking to do something different this year then take a look at our 5 inspirational ideas that you could implement into your Easter weekend. The grass may be greener on the other side. 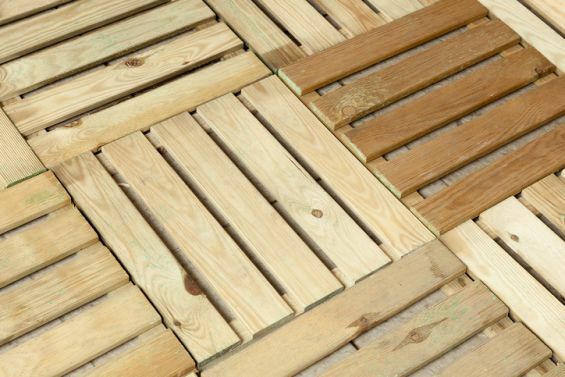 Last week we took a look at the benefits of composite decking and how the trend of artificial replacements to your everyday products are becoming a common site around the average household. 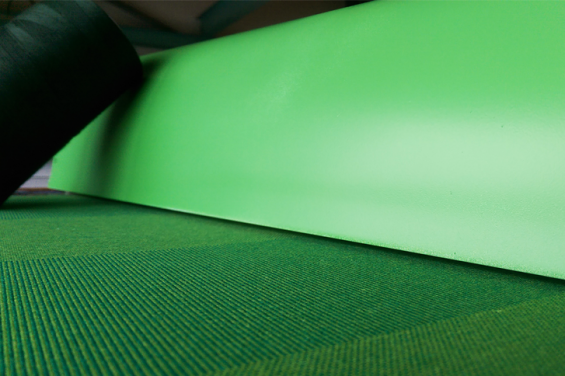 Another synthetic manufactured product that has seen an increase in demand recently is Artificial Grass, it has had a rocky past but it has progressed into a more respectable alternative to natural grass. 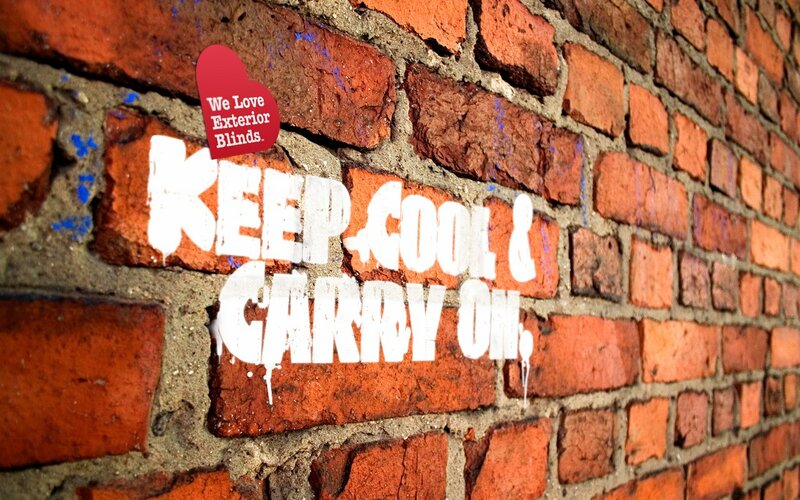 As we step into another busy season of shading the nation with the finest, innovative exterior blinds, we reflect on last year’s performance and analyse how we can make further improvements to continue to set ourselves apart. We take great pride in the service we deliver and how we deliver it, which is why we strive to surpass previous year’s achievements by setting the bar higher each time. 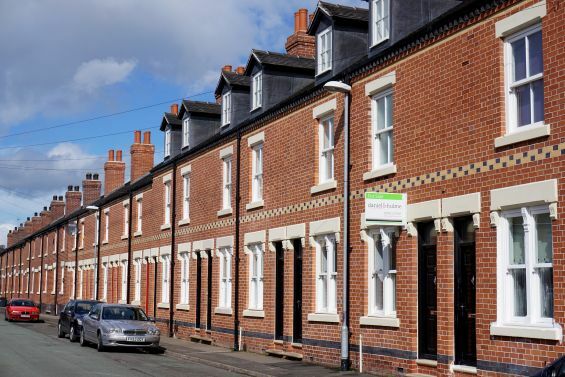 For many across the country it is proving difficult to secure a new larger home. With this being the case, instead of moving it is time start improving. Enhancing your outdoor space can increase the value of your property by as much as 20%. 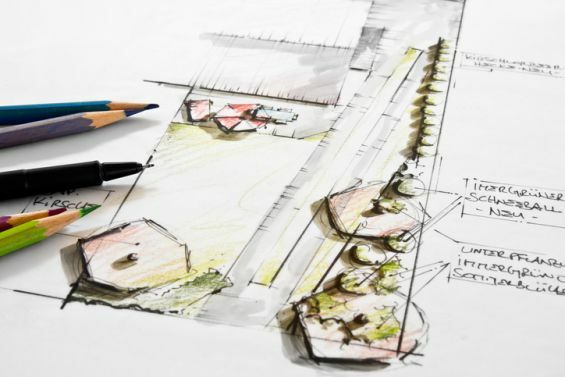 With spring just around the corner, now is the time start implementing your new development ideas so that you can utilise your garden to its full potential. Are you getting too much or too little sun? Sunlight isn’t limited to tans and good moods it is a vital part of our biological system and is an integral part of maintaining existence on earth. It is constantly delivering many UV rays to the earth, from light, to heat and of course UV (ultraviolet). 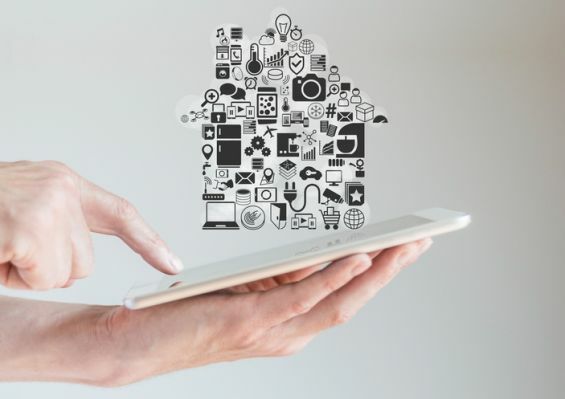 Are you making smart moves in your home? In a world where we are surrounded by technology, we are becoming more reliant on it to increase our productivity. 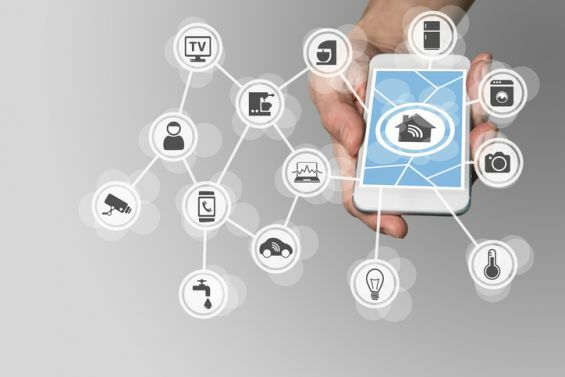 In the past decade there have been some technological breakthroughs which have impacted our lives and the way in which we function. Consider these improvements for one hot property! If you're thinking about moving soon or are wondering which property improvements add most value to your home, the search is over! Following research from a number of estate agents teamed with a study of potential buyers, these six features are a worthwhile investment as well as some great elements to look for within your prospective new home. Add style, space & sophistication! 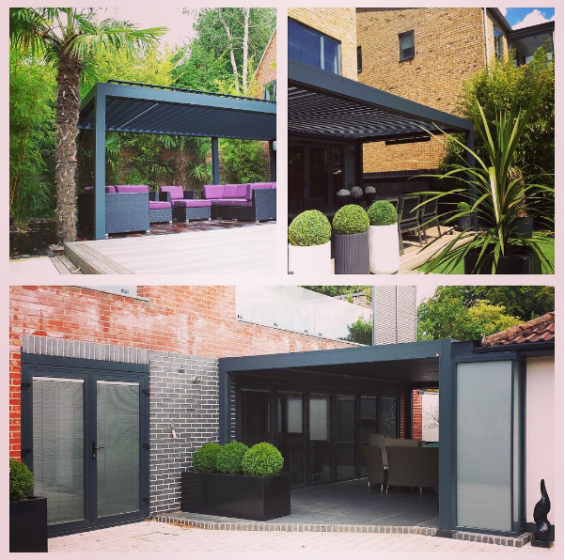 As well as offering a versatile extension to your existing living space, a well-designed outdoor area can add tremendous value to your home. 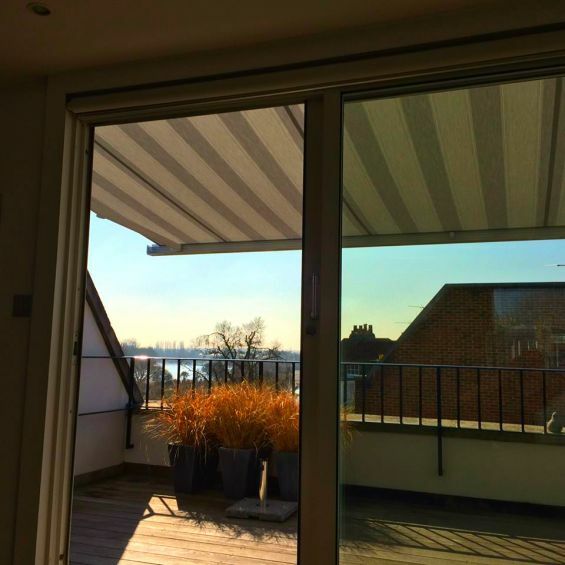 Whether you own a compact space or have a vast area to work with, there's plenty of ideas that can be adapted to your balcony, patio or terrace to enhance your enjoyment of this outdoor space. Could Gardening Give You A New Lease Of Life? Getting outside is the key to good health! Patients across the country have recently trialled a new 'green' prescription service in a bid to improve public health, with an overwhelmingly positive outcome. A recent survey found that 72% noticed positive changes to their health with more than half feeling stronger and fitter as a result of these lifestyle alterations. 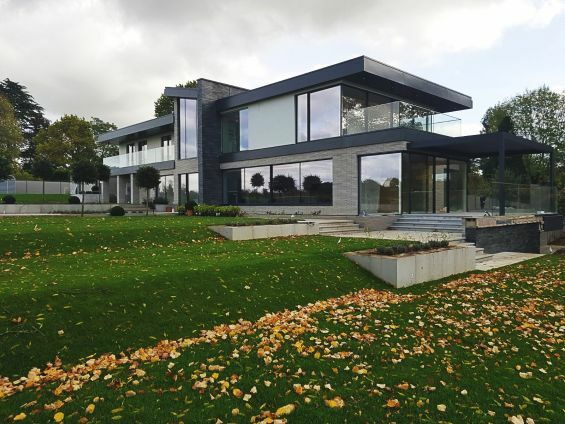 If you're thinking about remodelling or renovating your home in the near future, chances are you'll want to ensure you're at the very forefront of current design trends. These five innovative ideas are sure to give you a head-start when creating a property that's the best looking on your street as well as tapping into 2017's hottest looks. Make your zone your own! Whilst terraces were once seen as areas to merely sweep, plant and occasionally weed, they're rapidly becoming regarded as 'outdoor' rooms and essentially an addition to our existing properties. Make the most of your space this Summer with our five styling tips which are sure to add some substance to your space. All aboard the barbecue bandwagon! The British fondness for barbecuing is only set to continue as popular barbecue brand Outback announced excellent sales figures earlier today, surpassing all of 2016's sales targets. 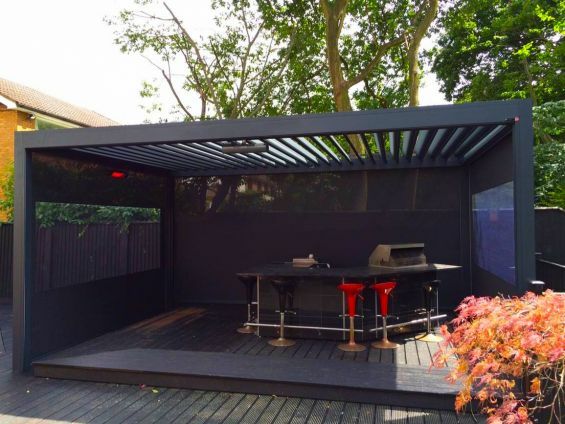 Despite some initial post-Brexit uncertainty, Outback's UK chief executive explained how among top consumer preferences, barbecues in stainless steel were in most demand, as seen above beneath our client's Outdoor Living Pod. 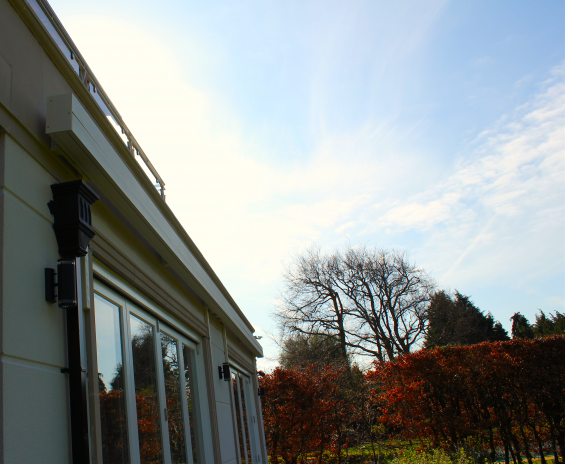 The first conservatories, formerly known as 'orangeries,' appeared during the 1660s, and whilst their purpose has evolved over the years, their popularity has remained relentless, with more homeowner's than ever before expressing a love for the classic glass room. 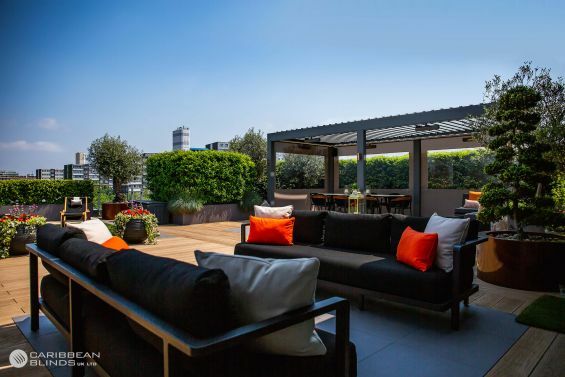 Following this week's news that 59% of homeowners are making outdoor living a top priority, with 43% replacing the traditional lawn in favour of hard landscaping options, it seems the Brits can't get enough of their alfresco living spaces. 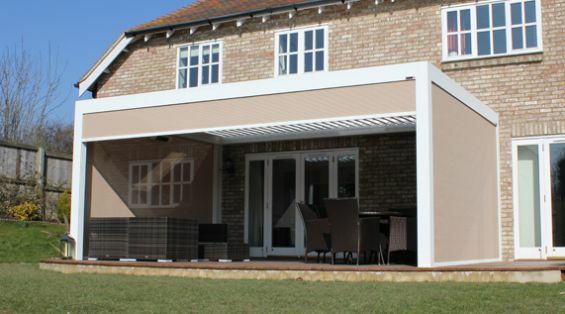 The sky's the limit with an alfresco lifestyle! 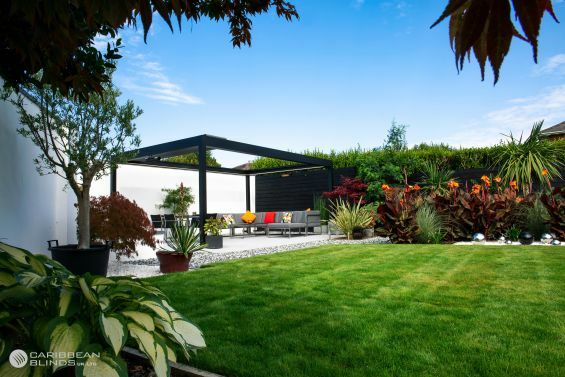 The 2016 UK Houzz Landscaping Survey unveiled an astonishing 59% of homeowners are prioritising outdoor living as the biggest influence in their overall outdoor project design. 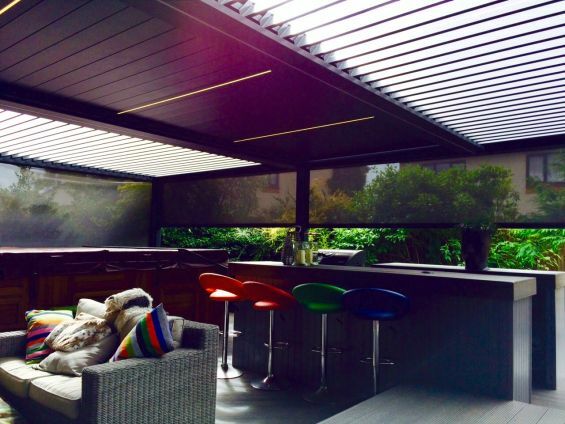 A louvered roof never goes out of style! Jazz up your garden this July! 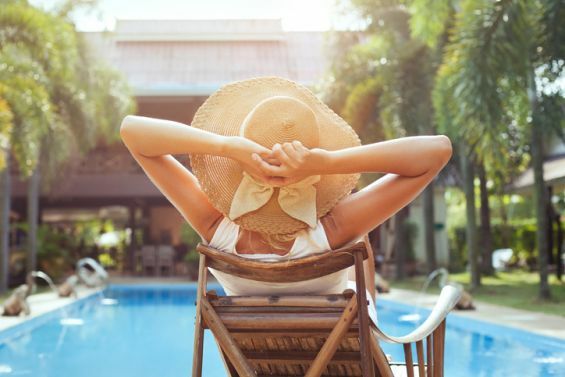 As the UK continues to bask in glorious sunshine, Brits up and down the country are flocking to their patios and gardens to make the most of the long-awaited warmer weather. 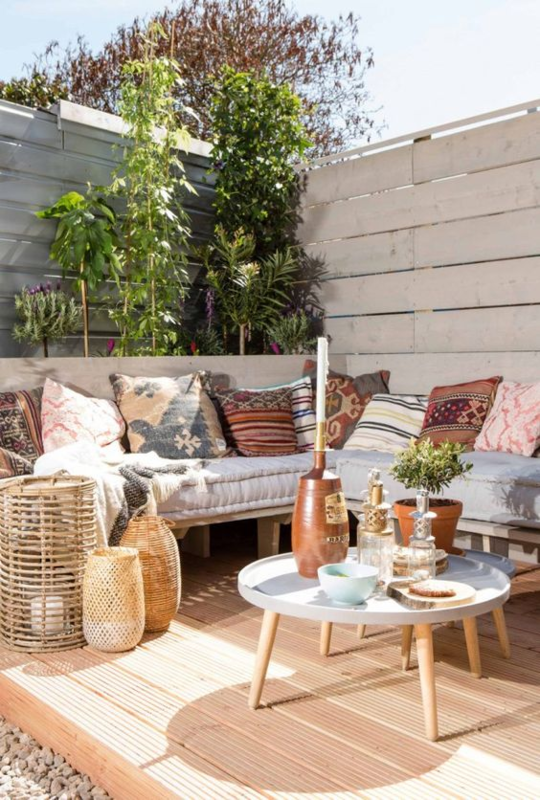 However, if you feel your outside space could do with a little revamp ahead of the weekend, these five ideas are an instant way to breathe new life into your alfresco area. A report published today discussed the way in which homeowners' tastes are changing when looking for a new property. The article explained how the search terms 'garden,' 'garage' and 'detached' were the most commonly used words, along with a 51% increase in the phrase 'furnished' compared to last year. 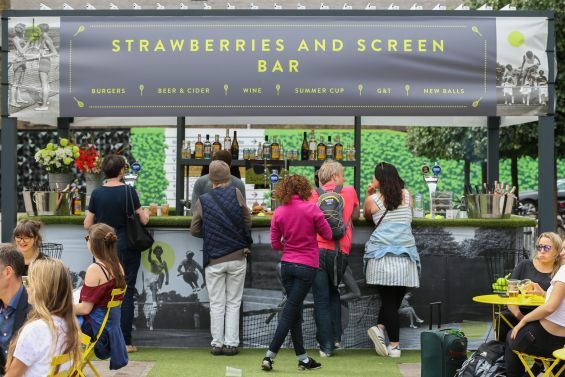 Our award-winning opening and closing louvered roof pergola canopy - Outdoor Living Pod, housed a pop up bar and barbecue this Summer for the Wimbledon Strawberries & Screen event from Monday 27th June to Sunday 10th July at Granary Square, King's Cross, London. 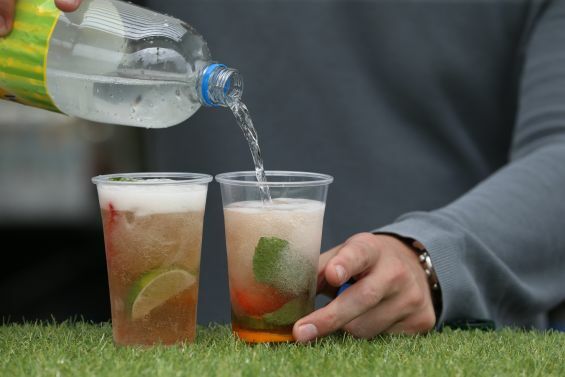 Run by The Lighterman, part of the Open House London group, tasty Wimbledon inspired food and drink were served beneath our Outdoor Living Pod to the 1,000's who gathered on the square to watch all the Wimbledon action on London's biggest and clearest screen. It's been another action-packed few months for the Caribbean team as we've been on the go non-stop transforming terraces up and down the country. 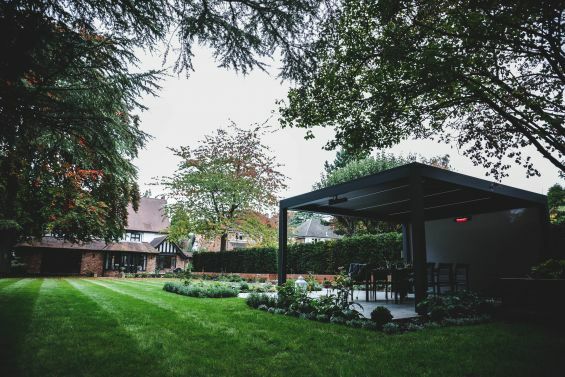 With the warmer (albeit temperamental) weather upon us, attractive alfresco areas that can be enjoyed all year round, irrespective of the forecast, have never been in such high demand. Calling all tennis fans! 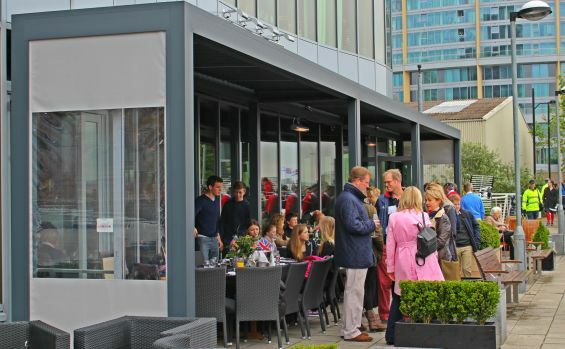 We're very excited to announce that our award-winning Outdoor Living Pod with waterproof opening and closing louvered roof, is housing a pop up bar and barbecue this Summer for the Strawberries & Screen event at Granary Square, King's Cross, London. Grand gardens top homeowner's wish lists! Whether you own a private or communal, small estate or balcony-style outside space, one thing is for certain and that is that gardens have never been so important to homeowners and tenants in search of an escape from their increasingly busy lifestyles. Today may signify the first day of Summer, but with heavy rain spreading across most of the UK, many of us woke up to a rather miserable Monday morning. 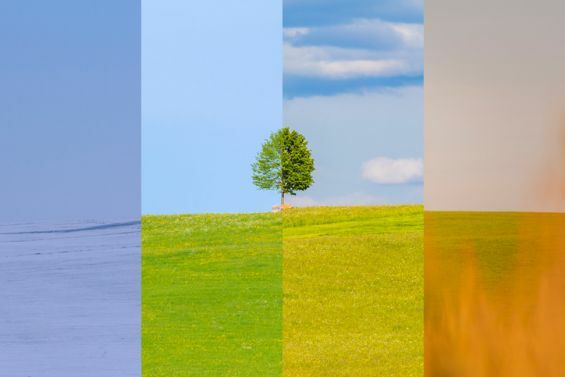 However, despite the recent washout, all is not lost, as Summer is finally set to make its long-awaited comeback, with warm sunny spells and temperatures as high as 25°C predicted up and down the country towards the end of this week. In a glass of their own! A recently published Houzz article featured some excellent advice about how to bring light into your home with the addition of a glass roof. 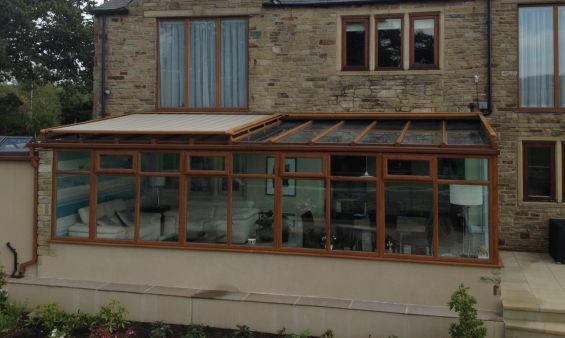 The article explained that whilst a large area of glazing is guaranteed to make an impressive architectural statement, as always there is a number of factors to consider before undertaking upon such project, one of which is the importance of considering the correct window treatments for your new roof. Create an authentic alfresco retreat! Outdoor living is all the range! 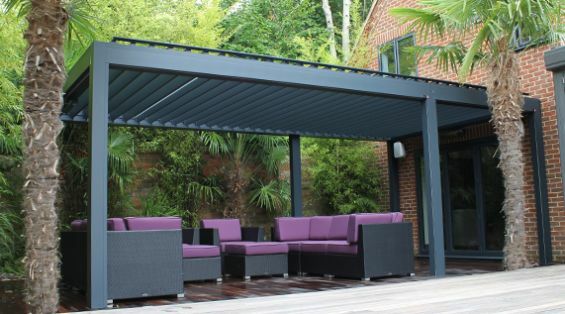 Despite our famously unpredictable weather, Brits are keener than ever before to put their outdoor spaces to good use, often by introducing an alfresco dining area which can transform a previously unused space to one of the most popular areas of the home. 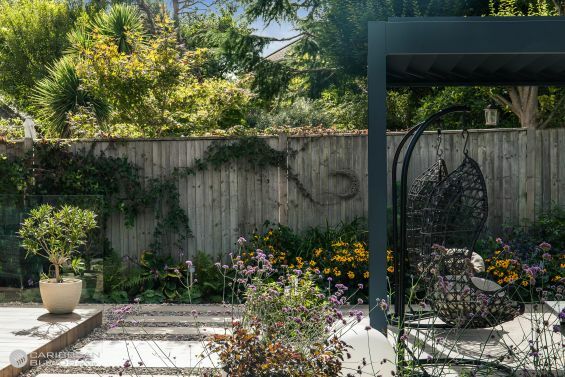 In fact, a recent survey of 2000 people conducted by UK Estate Agents Strutt & Parker revealed that when it came to the most important factors for our dream gardens, 'privacy' and 'space for entertaining' came out on top. Invest in an Outdoor Living Pod this Summer! Britons are wasting a staggering £672m per year on their gardens, according to a survey conducted by Gardena. Yearly, Londoners splash an average £1,000 on their gardens, but much of this expenditure goes down the drain due to garden calamities, often caused by a lack of knowledge. Reports published last week have revealed Skin Cancer is increasing amongst young people, with two-thirds shunning sunscreen in a bid to 'get a better tan.' 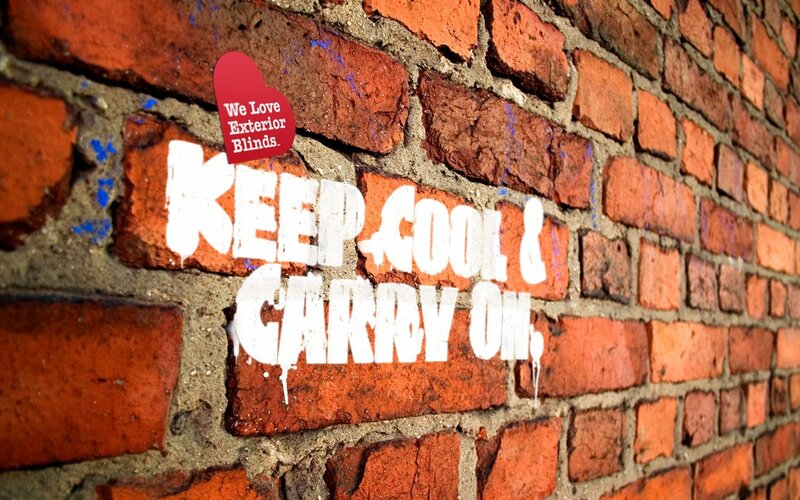 Teenage sun-seekers admitted to regularly getting burnt, whilst one in ten 13 to 24 year olds said they'd never worn sunscreen in a poll conducted by the Teenage Cancer Trust. 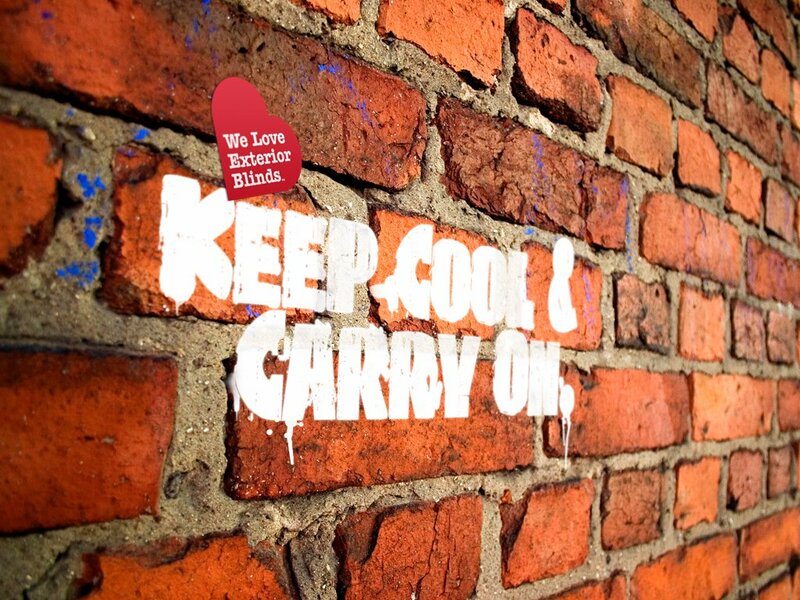 Renewable energy hotels are big business! New research published earlier this week has revealed concern for the environment is playing a big factor in Britons' hotel bookings, with one in five people saying they're more likely to stay somewhere if it uses renewable energy sources. 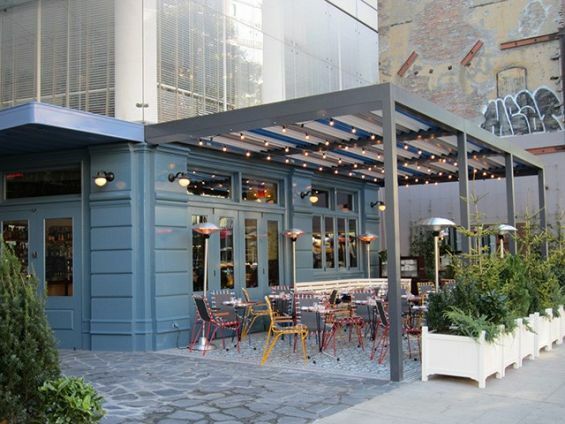 Alfresco Dining Has Never Been Hotter! With long-awaited blue skies and temperatures expected to be higher than LA this weekend, it's only natural many of us will be looking to wine and dine alfresco style to make the most of the glorious Spring weather. Caribbean have got it covered! 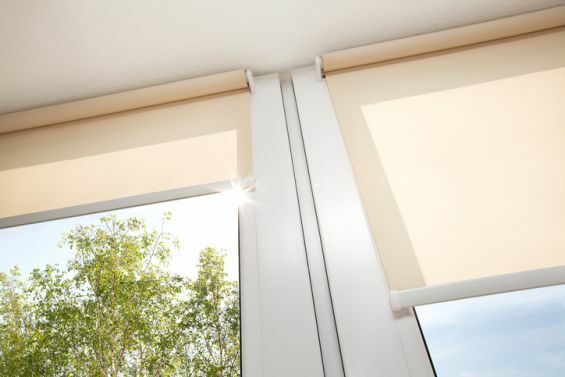 Caribbean Blinds recognises that with the passing of a long British Winter comes the desire for quality time spent outdoors enjoying the warmth and sun-filled Summer days. 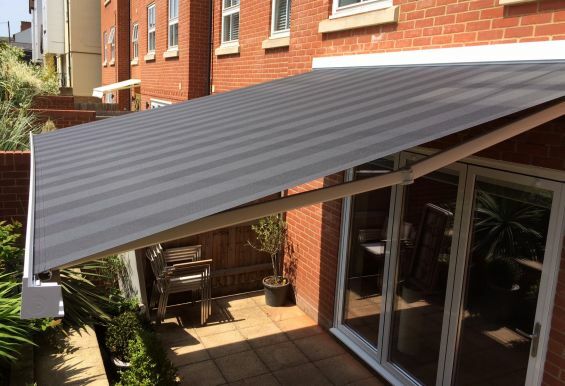 With the addition of a stylish awning above your patio or decking area, you can create your dream outdoor retreat, enabling you to safely soak up the alfresco lifestyle whilst remaining fully protected from the outdoor elements. Glass rooms have never been so desirable! First popular in the 80s, conservatories were an affordable and straight-forward way of increasing living space for families. 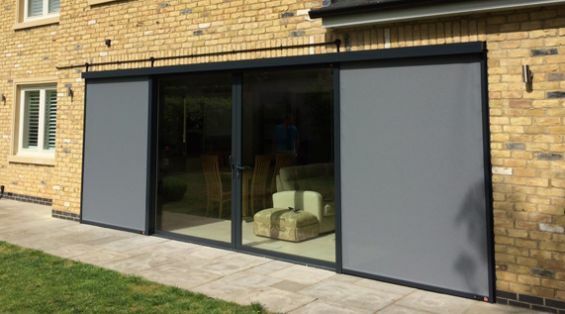 However, as they were often built from cheap uPVC panelling, and prone to freezing cold temperatures in Winter and unbearably warm temperatures during the Summer, they added minimal, if any value to a home, causing a subsequent reduction in sales. 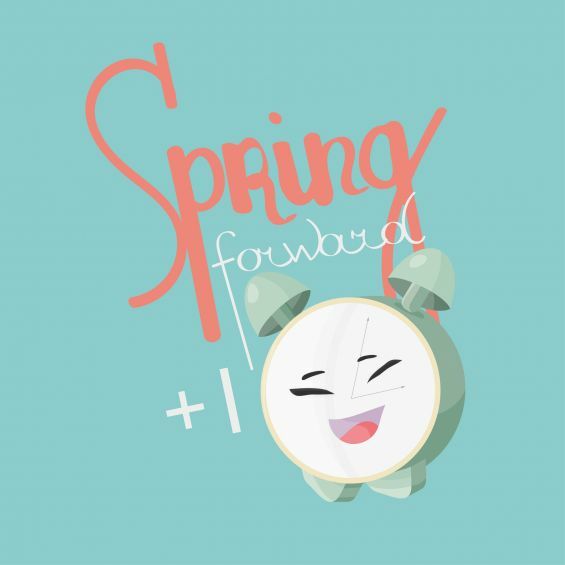 Let the light in this Spring! Whether you're extending, converting or renovating your property, roof lights are an excellent way of bringing light into your home, and generally speaking the higher the light source, the brighter the space will be. By providing up to 40% more light than a standard window installation, it's clear to see why roof lights have become such a popular choice for the modern-day homeowner. We investigate this modern-day must-have! 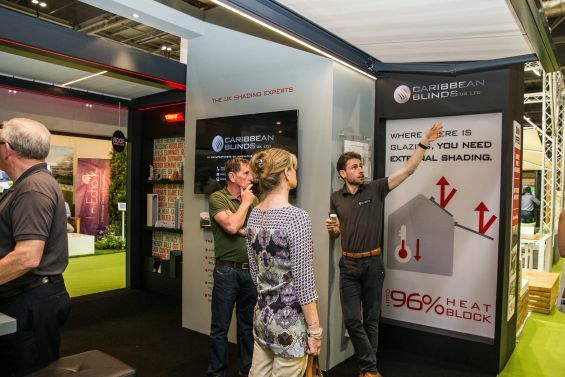 With the London housing crisis showing no signs of subsiding, a growing number of the city's homeowners are dismissing the high cost of relocation in favour of a “garden room” which can provide that all-important additional living space. Now that Spring is emerging, it’s time to break out of that Winter rut and update your home ahead of the lighter, brighter days. We show you how to give your a space a fresh new look this April with our six quick tricks. Following the cold, dark and sometimes uninspiring Winter days, many of us will be waiting in anticipation for the lighter and brighter Spring weather, and few things are more rewarding than enjoying the warmer climate from the comfort of your very own garden. 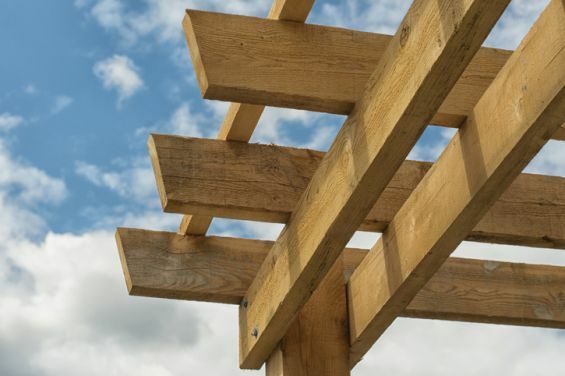 With Spring just around the corner, February is the ideal time to undertake any garden projects so you can enjoy your newly-transformed space to its full potential once the good weather arrives. With that in mind, here are some effortless-yet-effective ways for designing an elegant outside space that’s sure to be the envy of all your friends and family! Get your garden in shape this 2016! After the expense, excitement and over-indulgence of Christmas, January is the ideal month to get outside and catch up on any gardening jobs that may have been pushed aside during the festive period. With Spring just around the corner, this month is all about preventing damage from harsh weather conditions so your garden’s in tiptop condition when the new season arrives. January is synonymous with New Year’s resolutions, and whether this entails shaping up, kicking a bad habit or keeping our homes more organised, many of us pledge to make a change for the better in the forthcoming year. In fact, despite almost half of all Britons making a resolution, by the end of June, 50% of us will have discarded our good intentions, but it needn’t be this way! With 2015 drawing to a close, we felt it would be the perfect opportunity to collate our favourite design tips as featured on our blog over the past twelve months. 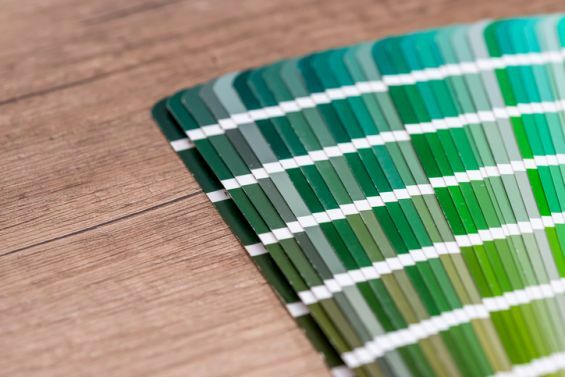 From introducing contrasting colours into your interior to designing a space that truly reflects your personal style, our top tips are sure to help you create a desirable home and garden without the high-end price tag. Enjoy! We Have A Winner To Announce! Who has won our £250 cash prize? However, there can only be one winner, and we'd like to announce that Sarah Price is the lucky recipient of our fabulous cash prize. Congratulations Sarah! A cheque will be on its way to you very soon, which is perfect timing ahead of the Christmas festivities. 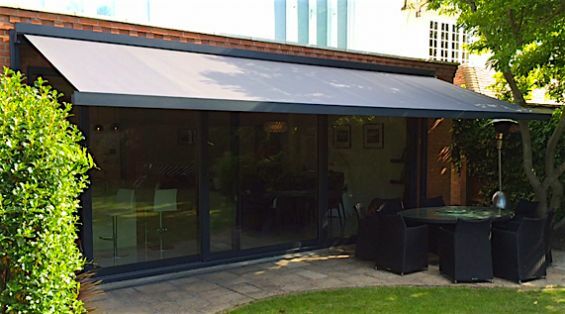 Although many fashions come and go, outdoor living remains as popular as ever, particularly in England where consumers are keen to take full advantage of any warm weather as well as maximising their usable living space. This trend is set to continue in 2016, with more homeowners than ever before opting to improve their garden to create a desirable area that can be enjoyed with family and friends. As 2015 draws to a close, it's only natural to look ahead and wonder what the new year will have in store. Whilst 1st of January inspires many people to eat right, save money and embark on a lifestyle overhaul, what goals will we set for our homes? Plus, if you prefer an artificial Christmas tree, these suggestions are a great way to add real greenery to your interior without the hassle of dropped needles! And if you're outside space is looking a little scarce this time of year, why not look out for the following on your next Woodland walk? As wining and dining plays a big part in the Christmas festivities, tableware is an excellent place to start. 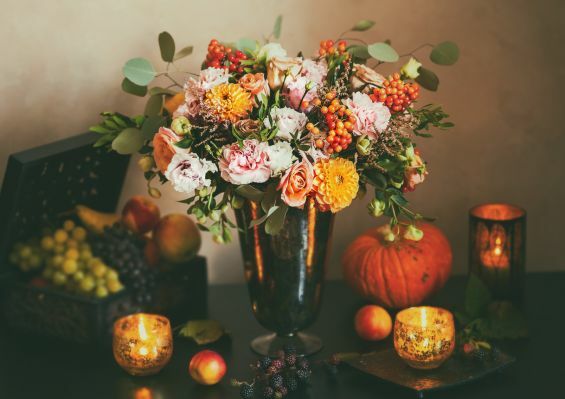 Be the hostess with the mostess this Christmas with our pick of the best decorative pieces. And don't forget if you're planning on taking the party outside this Winter, be sure to check out our guide to hosting an alfresco get-together with our Outdoor Living Pod. Now that Summer has been and gone, many of us are planning to spend more time inside during the Winter months- but this doesn't mean we have to stop appreciating the wonder of The Great Outdoors. This can be achieved by bringing a taste of the outdoors indoors with the introduction of a classic houseplant. Whilst during the Summer our gardens are used to their full potential for relaxing and socialising, once Autumn is upon us, many of us allow our outside spaces to fall into disuse. Given the colder weather and longer, darker evenings it's only natural to spend our Winter evenings wrapped up indoors- but it needn't be this way! With a recent dip in temperatures and Christmas rapidly approaching, now is a great time to embark on a few home maintenance jobs to ensure you can enjoy a stress-free festive season. From servicing your boiler to clearing out guttering, getting ahead with these 5 simple tasks will save you both time and money over the Winter months. Following the recent unveiling of the iconic John Lewis Christmas advert, it seems the countdown to the 25th is well underway, and as ever there's plenty of preparation to be done. Keep your table and chairs in tip-top condition! 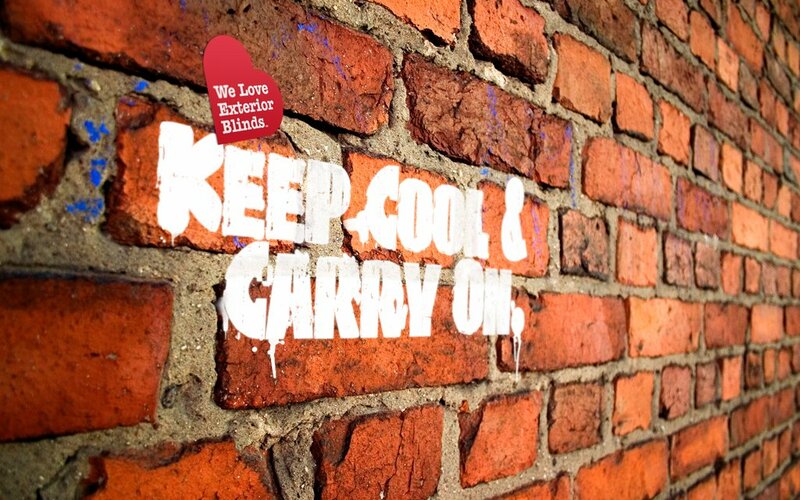 As it's often exposed to a variety of weather conditions, it's no surprise garden furniture can look a little worse for wear if it hasn't been fully protected against the elements. Therefore, in order to keep your garden furniture looking its best for years to come, it's well worth taking a little time to ensure your furniture is properly cared for- whether that involves coating it with a special oil, cleaning it regularly or simply investing in a waterproof cover. A recent article from The Guardian looked at the way our changing homes provide an accurate reflection of our changing lifestyles, and generally speaking, as our lives have become less functional and more about leisure, our properties have undergone a similar transition. Be the talk of the neighbourhood this Halloween with our pick of the best hair-raising home and garden accessories, as shown above. With fewer daylight hours and the weather rapidly deteriorating, many of us overlook the idea of spending time outside during Autumn and Winter. 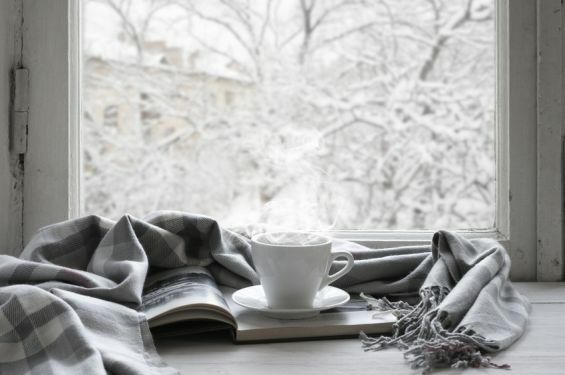 Although being confined to the warmth and comfort of our living rooms may appear a very attractive proposition when temperatures plummet, there's no reason why we can't still enjoy our gardens to their full potential during the Winter months. 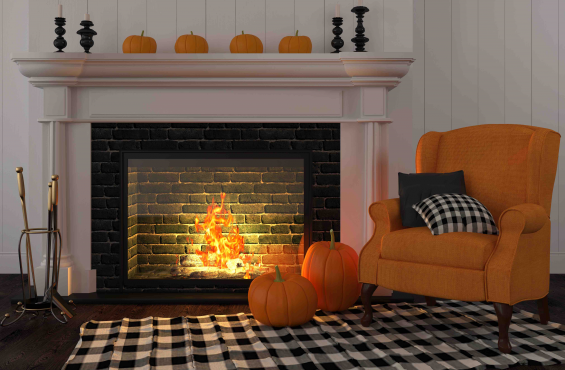 Look forward to lazy days in front of the fire and of course the imminent festive season with our pick of the best Autumnal home accessories. Additionally, evergreens are a great way to introduce permanent structure to your garden and work equally as well as stand-alone plants as they do as part of a mixed border. They can also be used for hedging which is a good technique for creating privacy and establishing an attractive boundary whilst welcoming wildlife to spend time in your garden. It's time for a post-Summer clean-up! This said, patios, terraces, fences and garden furniture quickly come up sparkling with the aid of a pressure washer, making them an essential tool in your cleaning up conquest. Because the soil is still warm from the Summer season due to slow heat absorption, it's much easier for bulbs to become established before the Winter frosts arrive. Within this type of environment, plants concentrate their energy on their roots to create a network that will last them a lifetime, hence why many gardeners believe "if you are ever going to plant a plant that will outlive you, chances are you'll do it in Autumn." 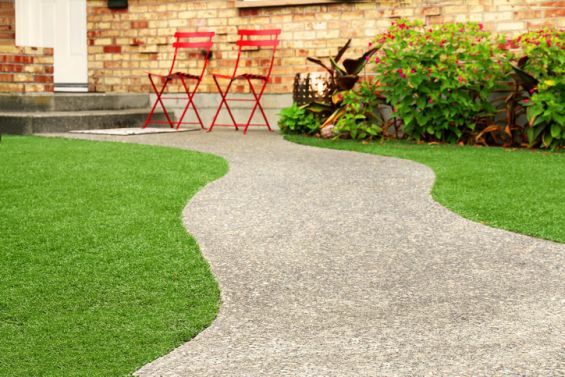 A recent news article revealed one in four gardens no longer has any grass, with a rising number of homeowners opting for low-maintenance alternatives such as decking, paving and AstroTurf in replacement of the traditional lawn. 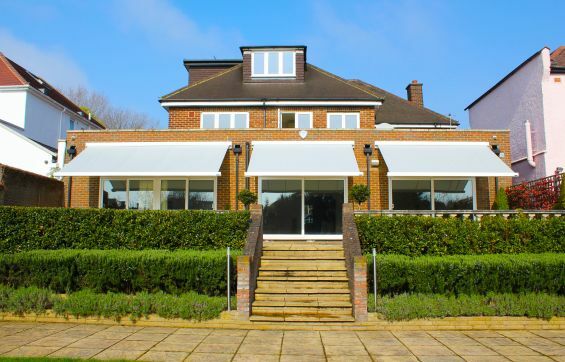 Therefore, if you'd like to comfortably enjoy alfresco meals and drinks with friends 365 days a year, patio heaters are an invaluable investment to your outside space. There's lots of different heaters to choose between, such as those that burn gas, the traditional chimenea and the recently-launched electrically-powered radiative heater. As Autumn approaches, shorter days and much cooler temperatures are on the horizon, making it all too tempting to stop spending time caring for our gardens. Whether you’re planning a family barbecue, garden party or simply enjoying a few evening cocktails with friends, our pick of the 20 best alfresco accessories are sure to give your get-together a stylish touch. 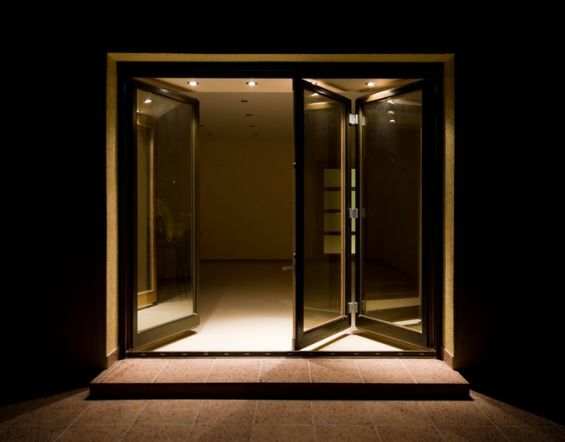 Essentially, there are four main types of outside lighting, ranging from security lamps to decorative lighting, portable fixtures and fitted designs. 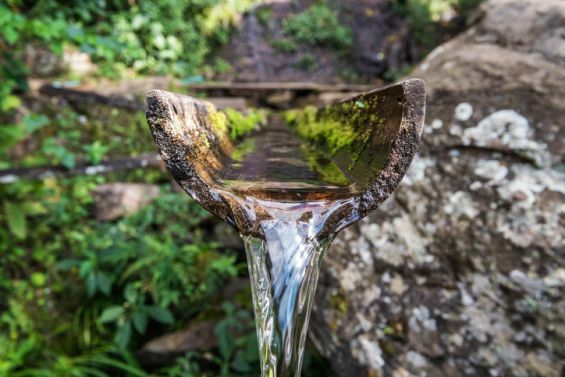 This said, self-watering systems effectively solve this age-old dilemma and significantly decrease the demand for watering, from daily to as little as once a week. What’s more, it’s very economical, eco-friendly and of course extremely healthy as home-grown food is bursting with far more vitamins, nutrients and taste than you’ll ever find on a supermarket shelf. From subtle, understated designs to features adorned with sophisticated LED lights, solar-powered water features create the ultimate centerpiece for your garden. With solar-powered features running entirely from free solar energy, there’s no hassle with plugs or cables unlike a mains-powered feature. When it comes to paving, choosing the right surface material is key to bringing your garden to life whilst complimenting the aesthetics of your home. 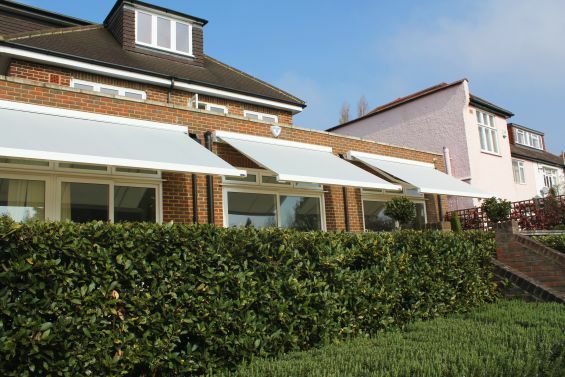 Not only do stylish paved surfaces enhance your outside space, they also create the perfect environment to enjoy some alfresco dining alongside our innovative patio awnings. Whether you are looking to create a whole new patio or just a small feature area, these contemporary paving ideas combine durability with wow factor for a space that'll shine for years to come. 3. How do you expect garden trends to evolve in the future? Fashions change whatever the industry, but in the garden it tends to take a while to get going and feed out to the masses. For example, outdoor lounge furniture is now seen everywhere – ten years ago, this would have been something we saw on holiday, rather than in our own back gardens. 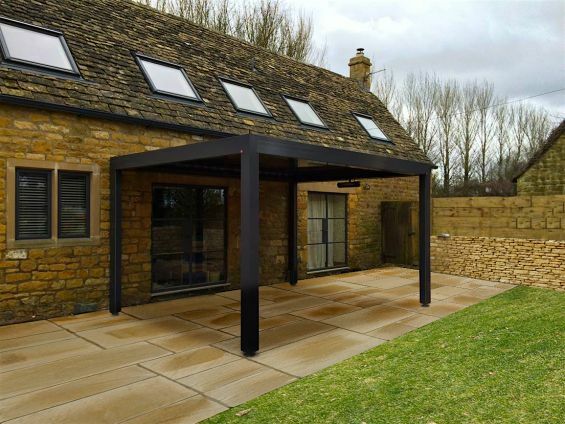 With paving, planting, shading and furniture to consider, it’s easy to dedicate as much time to designing your perfect outside space as you would the interior of your home. What with “attractive spaces for entertaining and relaxing” appearing as the top priority for homeowners in 2015, a well-designed garden has never been so desirable. With July just around the corner, there’s never been a better time to plan picnics, camping trips and garden parties to make the most of The Great Outdoors. 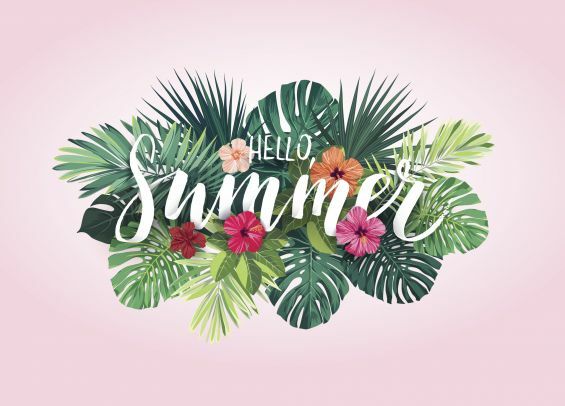 This said, irritating ants, flies, mosquitoes and stinging insects are all at their most energetic during the Summer months, threatening to ruin your outside enjoyment. Make a stand against pesky bugs this Summer with our top ten tips, enabling you to soak up the sunshine bug-free. There’s nothing better than relaxing on a warm Summer’s day with a fruity cocktail in hand. Today’s post showcases our ultimate cocktail recipes so you can sip in style all Summer long! What's more, they make the perfect accompaniment to our delicious barbecue recipes. 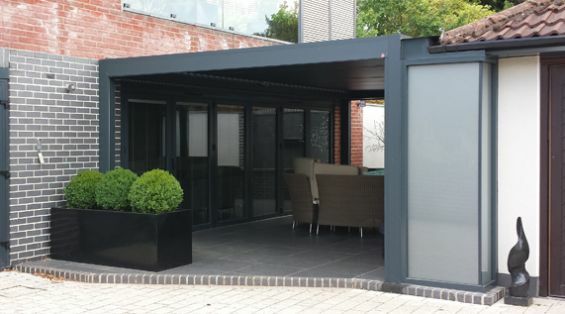 Enjoy on your patio, terrace or even better, in our Outdoor Living Pod for the ultimate alfresco experience. Cheers! Get grilling with our ultimate Summer barbecue recipes! Nothing says Summer quite like a barbecue and with the weekend on the horizon and the sun (hopefully) set to shine, it’s time to get the family together and enjoy the great outdoors. Today we present simple-yet-scrumptious recipes so everyone can grill with skill!